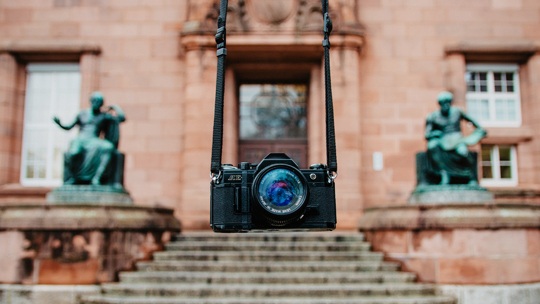 The University of Freiburg is holding the "Connecting Creative Minds" photography contest. What does creativity mean at the University of Freiburg? Students, researchers, faculty members, and administrative and technical staff are invited to take part in the "Connecting Creative Minds" photography contest. A selection of the images submitted will be exhibited at the University Library (UB) starting in mid-March 2019. Cash prizes will be awarded for the best contributions. The submission deadline is 28 February 2019. Creative minds – those are researchers, teachers, students, and administrative and technical staff members of the University of Freiburg. They’ve dedicated their passion, readiness to risk, and a strong desire to cooperate and network to give the university an outstanding position. "Our creative minds have made the University of Freiburg one of the best-performing and most innovative of German universities," says Prof. Dr. Hans-Jochen Schiewer, the university rector. They are therefore in the spotlight of the university’s strategy for the future, which is entitled "Connecting Creative Minds – Trinational, European, Global." The University of Freiburg intends to engage in dialogue about this strategy with all of its creative minds. One element of this exchange is a photography contest jointly organized by the Press and Public Relations Department and the UB Media Center. The competition’s key question is, "What does creativity mean at the University of Freiburg?" All members of the university community are invited to submit up to three photographs. The deadline for entries is 28 February 2019. A jury will select from all entries photographs to be shown in an exhibition in the foyer of the UB starting in mid-March 2019. They will also be displayed on the website, in publications, and social media of the university. The jury will award prizes to the three best photographs. The photographers will receive 500 euros for first prize, 250 euros for second, and 100 euros for third prize. What is more, during the exhibition the public will be able to vote online for their favorite images using the Excellence Portal. The photograph receiving the most votes will receive a 150-euro Popularity Prize. Anyone who votes will be included in a university prize drawing for hoodies and other items from the uni’shop. A modern university culture that promotes creativity, innovative formats for strengthening the institution’s research profile and developing of pioneering research ideas, as well as a strong, European, and globally inclusive perspective are what will guide the University of Freiburg along its path into the future. Hans-Jochen Schiewer says, "Creativity is exceptionally multifaceted at the University of Freiburg. We’re eagerly anticipating the interesting, unusual, and stimulating perspectives, subjects, and insights with which the contestants are going to surprise us. We look forward to the entries from our creative minds." For more information on "Connecting Creative Minds"